For a number of non-botanical reasons, I haven't posted for a long time so I have plenty in reserve now I am resuming!! One surprise this summer came at the weekend when walking in Banstead Woods. In many places there is a good cover of Impatiens parviflora, Small Balsam along path edges. Interestingly it also seems to be one of the earliest plants to be able re-colonise ground after Rhododendrons have been cleared, even so it still takes a couple of years before it can germinate. 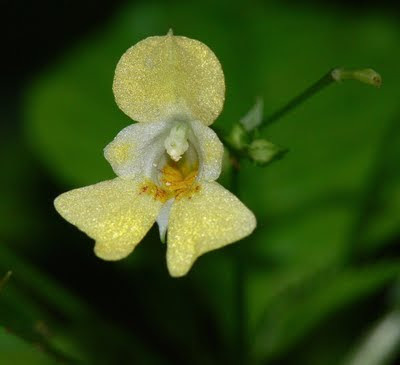 It is not a very showy plant only having a small flower, however, close-up (above) it is rather attractive. 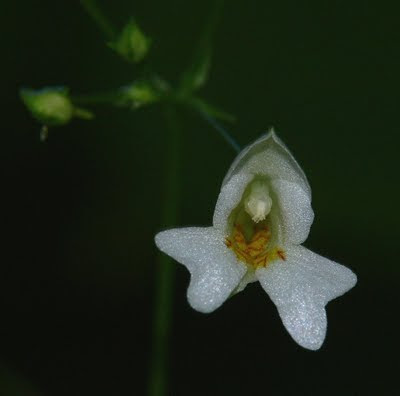 The base of the petals (and sepals) appear white with red markings with the rest being yellow. The surprise came when I stumbled upon a couple of plants with flowers that completely lacked any yellow (below) being white , the red markings more pronounced! White variants of many species are quite common but I have never seen it in this species, indeed I have rarely seen white variants of any normally yellow-flowered species. Off the top of my head I can only think of Primrose and even that was as a garden variant. Has anyone else seen a white Balsam?